A graphic artist and aspiring fiction writer, she is currently working on her first novel (rather, two or three at once). Cristen Elizabeth Rose is the nom de plume of a country girl also named Elizabeth who graduated from Florida State University with a BA in Creative Writing not too long ago. She lives in Tallahassee, Florida with her husband in an energy-efficient house in the woods. They share their forest with three goats and lots of wild critters, who are known to eat her heirloom roses without shame. 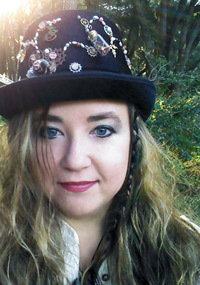 She writes steampunk, fantasy, and gaslamp fantasy with a romantic twist. She also creates digital art inspired by her stories. You can see some examples in this gallery. In the meantime, you may enjoy C.E. Rose’s short story, Wandering Jack, live over yonder on deviantART.